One Savvy Mom ™ | NYC Area Mom Blog: Fall Family Bucket List Craft - Plan For A Fun-Filled Season With The Kids! Fall Family Bucket List Craft - Plan For A Fun-Filled Season With The Kids! 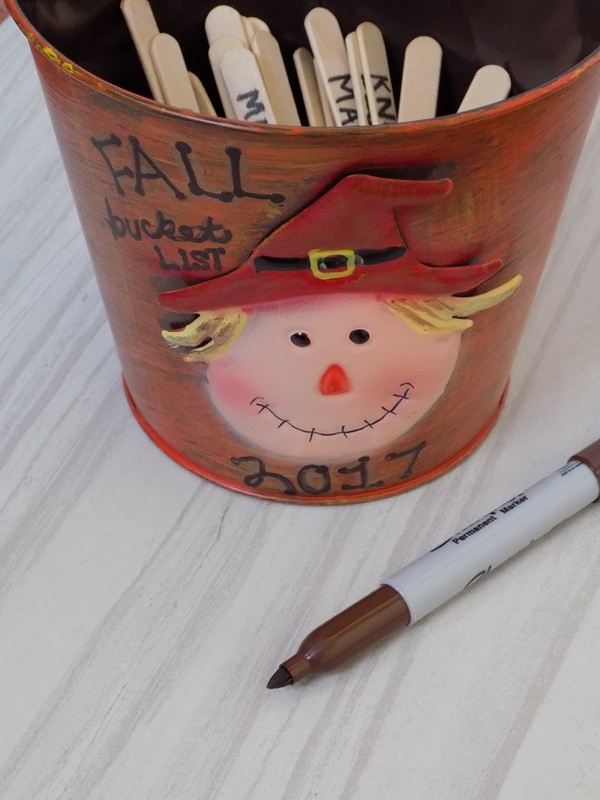 This Fall Family Bucket List Craft is a great way to plan for a fun filled season with the kids, and it's so incredibly simple to put together. Hi there, friends! Although the summer is quickly coming to a close, that doesn't mean that the fun has to end. 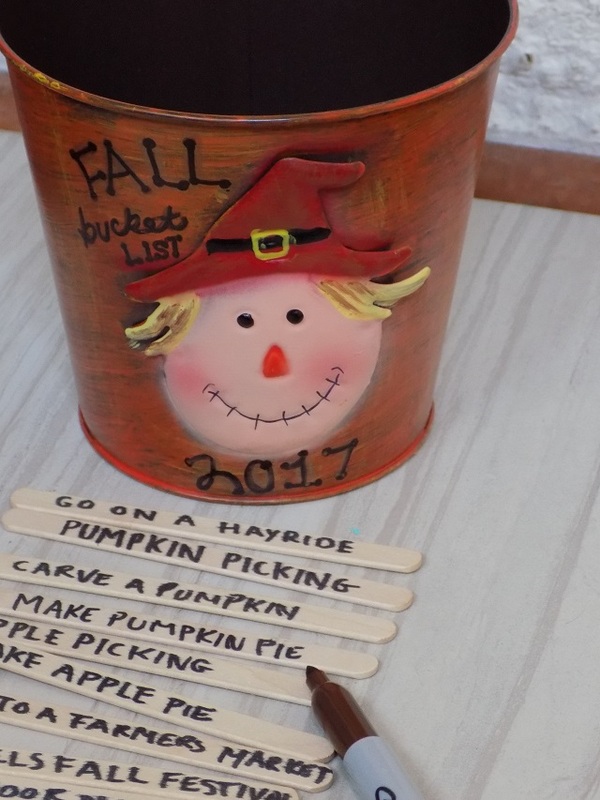 We are gearing up for a season full of memory making with the kids, and we started with this Fall Family Bucket List Craft. It only cost $2 to assemble, and the kids had so much fun tossing their ideas into the bucket! I can't wait to start pulling out a few ideas each week to do with the kids. This year, I've been working on mindfulness; being fully present in the moment, without distraction. This is such a good way to be mindful and planful moving into a new season, with plenty of unplugged family time on the schedule. Read on for my simple tutorial, and a few idea starters to add to your Family Fall Bucket List, below. a small tin, bucket,mason jar, or any small container really. I found the pictured fall themed bucket at our local Dollar Tree. Decorate your bucket tin, mason jar or container of your choosing. Add fun family outting ideas, fall activities, recipes you'd like to try during the season etc. to each popsicle stick with a permanant pen. 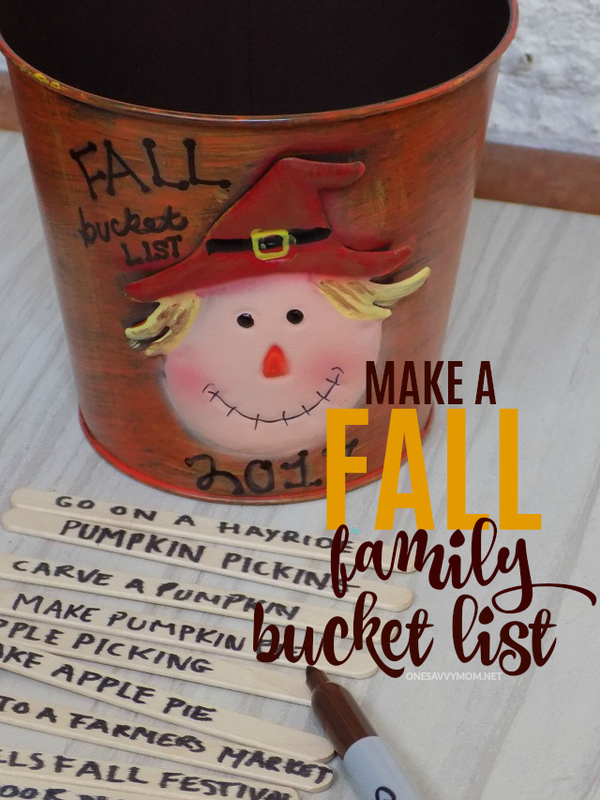 Add all of your bucket list ideas for the Fall season to your bucket, and place it in an area where the kids can see it (we have ours in our family room on a book shelf). Head to a fall festival. Do a Fall themed nature craft. Visit a pumpkin patch and pick your own pumpkins. Make a fall themed recipe (homemade applesauce after you go apple picking or homemade pumpkin pie). Visit a local farmers maket. Go to a Fall festival. Have a great season making memories with the kids. Happy Fall, friends!